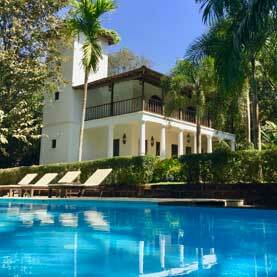 Villa Jardim is situated in the private garden behind the mansion, and has been remodeled in the Indo–Portuguese style that is unique to Goa, with a veranda and terrace over looking the stunning infinity swimming pool, and the peaceful garden rich in flora and fauna. 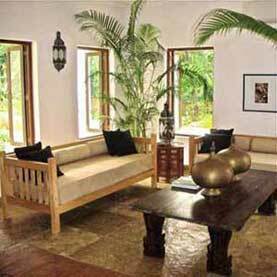 The villa offers stylish comfortable accommodation with modern facilities that include air-conditioning. 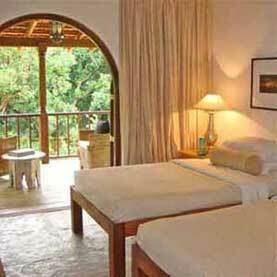 The two villa bedrooms that sleep up to four people have a large terrace that is cooled by the fresh breeze. 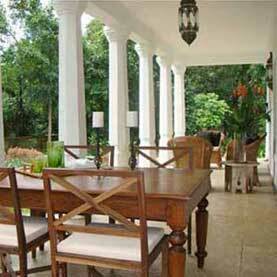 Dine on the veranda over-looking the garden and in the balmy evenings romanced by candle light. The European chef in the kitchen of the house offers superb Mediterranean cuisine that can be served to your villa. Enjoy the swimming pool or lounge on the deck, the villa staff will be on call, also they can assist with shopping or arrange transport and restaurant bookings. When you stay at Villa Jardim whether you are only two guests you will have exclusive use of the facilities, that includes the swimming pool.